I'm a Upromise Ambassador. I received compensation from Upromise in exchange for writing this review. Although this is a sponsored post, all opinions my own. Graduation is creeping upon us! Um, I know it's stressful on my daughter, but I never expected it to be quite so stressful for me! I was more expecting to show up with my tissues, lament over how my baby is ALL grown up, and then send her off to college in the fall with more tissues in hand. Unfortunately, that's only how it works on TV. This chapter in my life is filled with lots of tissues for sure, but there is a whole lot of planning and shopping that I didn't think about before. Between the party and the gifts and the college gear, I'm not sure if I'll ever be done shopping! Thankfully, I'm smart enough to shop through Upromise by Sallie Mae - a program that gives me a percentage back on everything I purchase through participating retailers toward my kids' college educations. Even if you have no kids, you can use your cash back to pay your own tuition or even your student loans! It's not like they have a bunch of unknown retailers to choose from either - we're talking about 5% back at over 850 online retailers that you already know and love like Macy's, Anthropologie, Alex and Ani, Overstock, Best Buy and even Walmart. You can also use the Upromise MasterCard and double your cash back rewards on online purchases. That's not all though. You get up to 5% back at participating restaurants, grocery, and drugstores too. So even the part where I take my daughter out for dinner the night before graduation will help me put some money away toward her college tuition. How awesome is that? It doesn't cost me anything extra either. If your purchase totals $20 without Upromise, it still costs $20 when you shop through Upromise. There's absolutely no reason to NOT get cash back. It's a no�?brainer. Now that you know how it works, feel free to sign up here (did I mention it's FREE to join?) 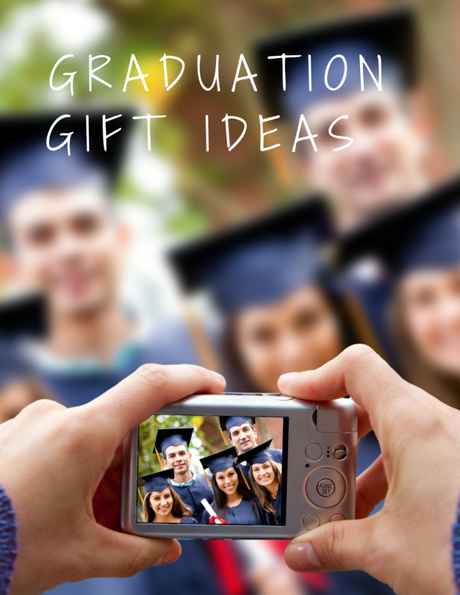 and take a look at these amazing gift ideas for your favorite grad! Fitbit Charge HR Heart Rate and Activity Wristband. The Freshman 15 is oh, so real. Giving your graduate one of these is a great way to remind them to keep up their activity levels even during long days of studying. It's so much easier to keep those pounds off than to try to take them off later, and the gift of health is really something you can't put a price on. The Fitbit products are available at Brookstone as well as a number of other participating retailers. Jansport Superbreak Backpack. A backpack is one of those things grads don't think they'll need, but they'll be super happy to have when they get to college. This one at Staples is really cute for a girl, but there are plenty of others to choose from too! Pajamas. Bedhead Pajamas has some really nice selections. This link is for women's pajamas but there are also LOTS of options for boys. Whether they're heading off to college in the fall or just staying home, there's just something awesome about getting new pj's. Dell Inspiron 15 3000 Series with Touch Screen. Make sure there are no excuses for not doing homework! Grads will love the touchscreen as well. It's a great gift for anyone, really. Not just grads. You'll even feel better about buying yourself a nice new computer knowing that the savings is going toward the kids. This is only the tip of the iceberg as far as graduation gifts go. You can check out some more ideas from Upromise here. Different grads will love different things, and all that matters is that it's given with love and best wishes for a bright future. I do still have many, many things to buy before college gets here, but it's really nice to know that I'll be able to put the savings from the gifts I buy my daughter now toward her tuition later!